So, you’ve been on the trip of a lifetime (or indeed a few trips of a lifetime), you’ve made memories and you’ve filled up a few hard drives with them too. Now you’re home, are you wondering what to do with your travel photos? If you have been collecting memories everywhere you go then you’re going to need somewhere to display them with pride. Sometimes I feel almost overwhelmed by all of the beautiful mementoes that I have from my adventures. For a while, I had no idea how to make the most of them, so they just ended up collecting dust in the drawers of my writing desk. But then I decided I wanted to think of some creative ways to display photos. I realised I wanted to display them somewhere that I could see them, somewhere that I could take a moment and relive the wonderful memories I’ve created. I’ve shared some simple ways to display travel photos and a few of the items that you’ll need if you want to create your own. One of my favourite things to do with my travel snaps is to create a hanging photo display. This one is so simple, budget-friendly and can even work for people in rental properties who can’t make any permanent changes to the walls. Aside from the obvious travel photos, all you need to create this one is some twine, miniature wooden pegs and some hooks. I used clear, Command Hooks which are damage free. For those that aren’t familiar with Command Hooks, they adhere to a sticky strip which, when removed properly, do not damage the wall or paintwork that they’re on. Command Hooks also work by weight, so make sure you are getting the right type for your project – travel photos, twine and mini wooden pegs don’t weigh too much so you should be fine with the smaller types they offer. Pro tip: If you’re finding it difficult to decide which pictures deserve to make the cut for your photo display and, short of wallpapering your entire room with your travel snaps (which is another great idea), it can be a good idea to decide on a theme for how you want your photo display to look. My finalised theme for my hanging photo display was to create a timeline of the destinations I visited on my American road trip using the photos and postcards I collected along the way. If, like me, you’ve still got plenty of everything left over (but still have plenty of photos to display) you could also create a vertical version of the hanging photo display too. 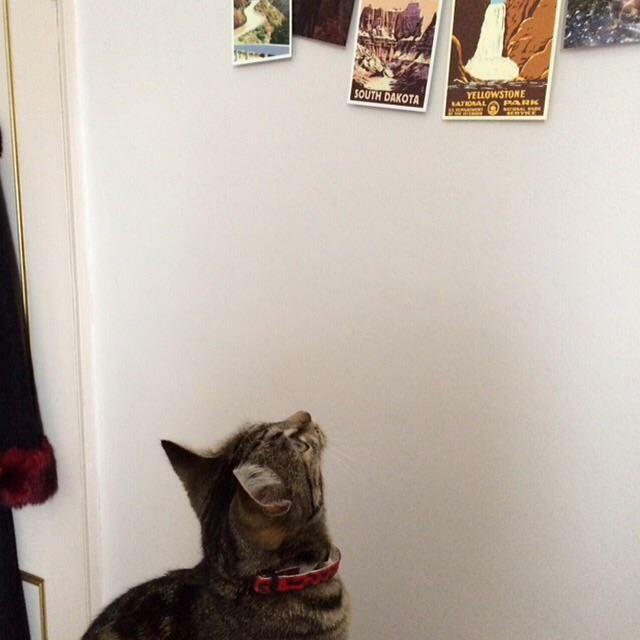 This way to display my travel photos seems to have captured the attention of my cat. If a hanging photo display isn’t your thing then you can still create a wanderlust-worthy travel photo display with a feature wall. A wall decal/ vinyl is another great low-cost, non-permanent way to celebrate your travel memories (I purchased mine, in metallic gold, from Icon Wall Stickers). This one I needed a little assistance with to get it onto the wall (I think a few nations might have lost some of their teeny tiny islands in the process… sorry about that guys!). Try placing your travel photos around the map to mark where you’ve bee on your travels (if you don’t have any limitations on what you can put on the walls you could use twine and pins as a fun way to mark the exact locations). If you do ever get bored of the wall sticker (unlikely) all you have to do is run a hairdryer over it and apparently it can be easily removed damage-free. If I had enough surface areas then I would definitely be trying out these different ideas for displaying travel photos. If you want a bolder look than the miniature pegs, and you had the right strength hooks for it, you could use metal clips instead. I also really like the idea of using mini clipboards as frames for your travel photos, you could either hang these or display them on shelves around your room.